Disney is now the official owner of Rupert Murdoch's former entertainment empire, 21st-First Century Fox. The mammoth $71bn deal - completed on Wednesday - brings the likes of X-Men, The Simpsons and Fantastic Four characters to Disney's already impressive film catalogue which includes Star Wars and Cinderella. Disney now also owns the Fox film and TV studios, National Geographic and Indian TV giant Star India. Ultimately, its aim is to compete with rivals Netflix and Amazon. Robert Iger, the chairman and chief executive of Walt Disney, said the deal's completion was "an extraordinary and historic moment" and critically one he pledged would "create significant long-term value for our company and our shareholders". "Combining Disney's and 21st Century Fox's wealth of creative content and proven talent creates the pre-eminent global entertainment company, well-positioned to lead in an incredibly dynamic and transformative era," he added. Here are five charts that help explain the scale of the combination. Disney has scooped up Fox's movie and television studios, regional sports network and international holdings, among other investments. It has also gained the FX and National Geographic cable channels, and Fox's regional sports network in the US. Fox is creating a smaller firm, focused on news and major live sports events in the US. It will hold onto its flagship Fox News Channel, Fox Business Network, Fox Broadcasting Company, Fox Sports, Fox Television Stations Group, and sports cable networks FS1, FS2, Fox Deportes and Big Ten Network. 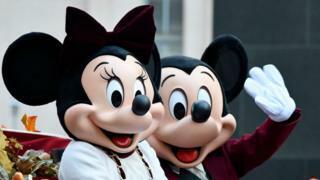 Disney already owns a vast array of news, film and leisure companies. But the media landscape is changing as technology companies like Amazon and Netflix attract customers to new ways of viewing. Disney is investing heavily in online streaming platforms, as a way to counter a downturn in its pay-TV business and threats from these new rivals. But its purchase of Fox will enable it to enhance its offer. Disney is already a dominant force in the US. The Fox acquisition will make it even more competitive with online rivals such as Netflix, by giving it more shows and movies.